I'm having such a fun time reading all of your comments and learning a little more about you. Yesterday's number one response was the desire to learn applique. Today's book will help you with that. 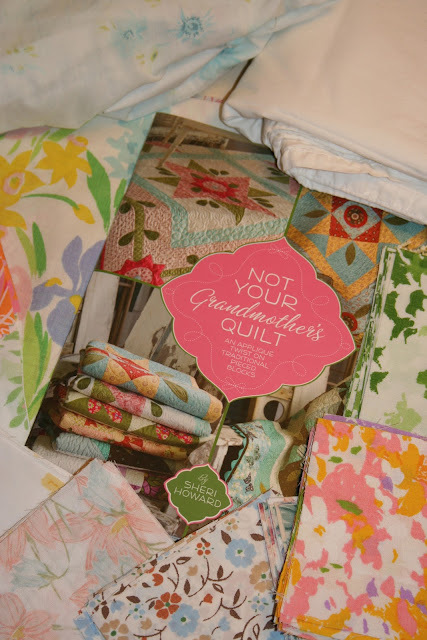 This giveaway includes the book, "Not Your Grandmother's Quilt" by Sheri Howard. Beautiful quilts with an applique twist on traditional pieced blocks. The applique is not involved which makes it a good book for beginners to intermediate. With it I am including my entire vintage sheet stash. That is over 200 5" blocks, 15 10.5" blocks, a large vintage white sheet for piecing and sashing and a large floral sheet for backing. For additional ideas on how to use vintage sheets, visit the Vintage Sheet Blog found here. Be a follower of "Sewn With Grace"
which reminds me of her laughter when I wear it. See you tomorrow for the final giveaway! Wow what a giveaway! I have been stalking thrift stores for vintage sheets! I treasure a sewing box that was my Grandmothers. I thought about "saving" it and not using it... but I love the memories each time I open it up to mend. Thanks for the chance. I have inherited the large yellow pyrex bowl from my grandmother. I have so many wonderful memories that sprang from that sunny mixing bowl. Popcorn on a Sunday night watching The Wonderful World of Disney; making chocolate chip cookies while wearing an apron...but no pants :-) and the wonderful yeasty smell of my mom's rolls rising. Pretty good stuff! Another wonderful giveaway - Thank you! What a well thought out giveaway! I treasure vintage linens from my husband's grandmother (Omi). She was a dear friend to all of us. My mother in law noticed that I was using one of Omi's Christmas linens as a runner on our table over the holidays and found one more matching one in her linen closet that she shipped me from Chicago when they returned home! Happy Birthday! I inherited my great grandfather's rocking chair. I love it because it's comfortable and aged, and there's nothing like it nowadays. Thanks for the giveaway! Thanks for the giveaway, I have never seen or used vintage sheets before. Let see I inherited alot of old photos from my husbands side of the family.But my absolute special thing was on my mothers side,which is all greek I inherited a lovely vintage greek teaset.Love it! I must say Im loving these giveaways books.. you can never learn enough from them. I inherited some cuff links from my grand-father, to pass onto my son when he's old enough. I love that he will get to wear something of his great-grand-father's, something I remember him wearing. Thanks for the great giveaway! I inherited my grandmother's tea pitcher. It is a wonderful blue clay pitcher with cows on it that she got from a rolling store. I always thought it was a magic pitcher because her sweet tea was so good. I have a small sewing cabinet from my great aunt. She taught me to sew and I kept the wooden spools that were in there and it reminds me of our special times together every time I get something out to use to sew. Can I only choose one thing? A couple years ago my mother gave me my grandfather's silver in a lovely lined box. I spent hours polishing it and we used it at holidays several times before my mom died. She also let me look through a storage building and find the set of depression glass dishes that were my grandmothers. They are so pretty. I don't use them but have them on display. I've been reading through my quilting books trying to decide on something to make. That book looks like it would be a great addition. I inherited my grandmothers wedding ring. It is beautiful and I feel honored that I get to wear it daily. This is a neat twist on a giveaway. I really like this. This is my story. I have a really really old tattered quilt. I found it in a trunk of my mother's and asked her about it. She said it was the only possession my Grandfather Nelson (her father) had left when his mother died and he and his 2 brothers were put in an orphange. He held on to it (he was 9 yrs old and the oldest child) and passed it on to his oldest child (my mother). When I first found it all I saw was an old stained ragged quilt. When I examined it carefully (years later) I found that there is another quilt underneath the outer muslin cover. The quilt on the inside is even older and more tattered. The batting is raw cotton. I call this quilt the 'requilted quilt'. Someone probably his mother covered the original quilt (when it was falling apart) with plain muslin and quilted it together. I have no idea how old the original is but I can trace it's history nearly 130 yrs. The fact that someone cared enough to preserve it and pass it on brings tears to my eyes. I am the oldest grandchild with no children of my own. I am not sure yet who will get it from me. I hope it will stay in the family. That a child and a boy at that tried to hang on to it, says a lot. When I hold this quilt I feel a connection with my ancestors. I hope your birthday week brings you lots of happiness and pleasure. Oh my gosh, oh my gosh, oh my gosh. A dear friend of mine has just moved into her first house. Not her dream house, mind you, but her first home. She realizes she is blessed and is trying to fix it up to look nice. I asked her about decorating plans, and since they are just starting out they are going to have to decorate on a shoestring budget. She told me she has never had a quilt and dreams of having one someday. I decided right then and there that I am making her a quilt. Here is the reason I want so badly to win this giveaway. I asked her to please send pictures of some quilts she loves and she sent me pictures of quilts made from vintage sheets! Please, please, pick me. Not for me but for her, she is the sweetest person in the world and I would love to make her "perfect quilt". She would be so happy, and I would be so happy to make her happy! WoW what a giveaway!! That all sounds sooo wonderful and so generous of you :) I would LOVE Love some vintage fabric for a new quilt! My husband and I last spring/summer time inherited some amazing vintage dishes. We got 2 different sets and they were his 2 grandmothers. We both love antique and vintage anything, and the fact that we know the history of them and that they were in our family is even better! Thanks for the chance to win!!! I have an antique metal bed frame that I got from my grandmother. My husband had it painted white for me. I have a white chenille bedspread on this bed, and topped off with my most current quilt that I just made! I am a follower. I love, love, love vintage sheets and the books looks gorgeous. I have been given the Lane hope chest that belonged to my grandmother, who had gotten from her mother, my great grandmother. It still has the original take stapled inside the lid. Everytime I open it I wonder what they put in it and what there hopes and dreams were. It is very special to me. I'm a happy follower! What a fabulous giveaway! My most precious inherited thing is my Mum's engagement ring - it's monetary value is very small but to me it means everything - I intend to pass it on to my daughter one day. WOW! My mom just picked up some vintage sheets at an estate sale and gave them to me. I just finished a quilt top (wallhanging) made with some hand embroidered blocks by one of my great aunts. They didn't come straight to me but trickled through another great aunt and then my grandma gave them to me. It feels good to be connected to a prior generation by our craft. I hope to get it quilted and put it our guild quilt show. Oh such kindness to share so much. I have a book that my father gave me. I lost my Dad when I was much to young. The book was "over my head" then, but it is my go to book now for solace and guidance. I feel like it was my Dad's way of being by my side, when he could not. The book is Thomas Merton's "Seeds of Contemplation". A treasure for my heart. I just love reading your blog, and your give away is incredible! I have a cameo also. It was my great grandmother's. She died when I was 9, but I have lots of memories of her. She was a very kind woman. My mother gave me the cameo to wear on my wedding day with my dress. It matched perfectly! I will give it to one of my grandaughters on their wedding day. The tradition will carry on. This is a wonderful giveaway. I love applique, but have never really mastered it. Thanks for the chance to win this book, which would be very helpful. As an only child, I inherited my mother's lovely Coalport china. The pattern is called Fragrance; sweet little bunches of flowers on white, with scalloped edges. It's long since been discontinued so I don't use it very often, but I do love to look at it set out in my china cabinet. Wow! Beautiful! I have inherited my great grandmother's treadle sewing machine. It came in a darling cabinet. It doesn't currently work but I am hoping to find parts for it someday. I learned to sew on that machine when I was about 5. I love inherited things. They give me a feeling of connection with my past. My most prized inherited possessions are a wooden dough bowl that my great-grandmother used, who died in 1925. I love to imagine her hands in that bowl, mixing up biscuits 3 times a day for my grandmother and her siblings! The other of my most cherished possessions is a bedspread made by that same great-grandmother. She drew a design free-hand on a sheet, then used embroidery and candlewicking over the design. I love it and will never part with it! I also have two quilt tops from her daughter, my Granny, that I want to finish someday in the manner Granny would have done them. I love the giveaway today - right up my alley! Thanks for the chance to enter! I was given my mother's old Singer sewing machine along with her old sewing box. She wasn't an extremely talented seamstress but did her best. I don't have many of her things and so I cherish these things. MY GRANDMOTHER GAVE ME A BEAUTIFUL LITTLE OBER IRON MARKED 1896 AND I'D GUESS SHE USED IT FOR LITTLE GIRLS PUFFED SLEEVES-ANY TINY AREAS. I TREASURE THIS LITTLE IRON-IT SITS ON TOP OF MY FAT QUARTER CABINET NEXT TO A LITTLE DOLL. Renee, you are so generous. I have a collection of just a few vintage sheets...somewhere. I would love that book and the sheet collection. My very favorite thing I inherited is a childs wicker rocker that my Mom received for her 4th birtday. The thing that makes it special is that my Grandpa tied it on the top of my car in Illinois and I drove to California with it. My 1st son was 3 at the time and my Grandpa wanted him to have it. What a generous, fun giveaway! The smallest items are the most precious to me! I have my Mom's long fork that she used constantly when cooking, and also my Gram's. I use them every day! I treasure the hand painted cat ornament from my Mom, as well as the Christmas ornaments my Dad collected and lovingly divided between his children. I inherited my aunt's beautiful cherry desk--it's not a roll-top but has a let-down section that you can lock up or pull down and write on with plenty of little cubbies in it. Hope you're having a great birthday week. I am a happy follower and I love vintage sheets! I have made two quilts from them and have a third in progress. I would love to mix your stash with mine! I have my grandmother's sewing box. She gave it to me when she moved into a retirement home and I cherish it! Thanks for the chance! PS Are you moving? I have that book and can truly say that it is a wonderful book! Your birthday week is a lot of fun for your readers! Good luck to all of them!! I'm a happy follower, you inspire me!! I'd love to expand my quilting know how! I treasure my Mom's english china and am always on the hunt for more!! Please enter me too!! I have a painting of my mother that hangs in my entryway. It is a lovely portrait of her from when she was young and shows off her long neck and pretty face. When my daughter wears her hair up she looks so much like her I tend to tear up. The portrait hangs near a young picture of my father in his Army WWII uniform, which is next to an almost identical picture of my son in his current Army uniform. I feel very connected to my parents when I see them in my children, and I cherish both of these family heirlooms. Thank you for this lovely giveaway! My grandmother's Christmas pudding recipe and her preserving pan. When I was small, my grandmother made the Christmas puddings, then when I was almost out of my teenage years my Nanna became quite ill and took over making the puddings. A few years ago my mother decided it was my turn and now DD and I make them together. I know many people don't like Christmas pudding but in our house it is a favourite and it wouldn't be Christmas without it! I inherited two of my paternal grandmother's quilts that she made. I remember all of her beds being covered in quilts and how warm and cozy they were in the Montana cold. Thanks for the opportunity to enter another of your great giveaways! We are the black sheep in my husband's family and was not even told when his grandmother passed away. Nobody wanted her good silver so his sister offered it to us, of course I was so happy. This is the only thing I have from his family. Last year for my birthday, I asked my uncle who was now living in a retirement home if I could have his china, my aunt passed away many years ago and it was a wedding present to them 39 years ago when my mom was pregnant with me. A favorite thing I inherited is a beautiful quilt lovingly made by my grandmother. I inherited my mothers wedding ring and although my husband had the diamonds put in a beautiful new setting, I can't look at it without thinking about her : ). I also have some vintage sheets fom her! I am wearing my Grandmother's wedding set. I got that when she passed away. It does not have much monetary value....oh but is it priceless to me. And what makes it even sweeter is that my grandparents got married on Valentines Day. I inherited my mother's wedding rings about 55 years ago and have been wearing the engagement ring nearly every day since. I was chosen to have the rings because diamond is my birthstone. A friend of my mother's told the family that it was her wish that they be given to me. Of course this keeps her memory very close. Thank you for reminding me. Have a wonderful birthday tomorrow! Dearest Renee...I love your blog and your testimony comes through so sweetly to all of your readers! Thank you for your generous spirit...Renee. Your birthday giveaways are so filled with love. My favorite Christmas gift was from our son, Timothy, who is in Afghanistan. His phone call came early Christmas morning...and, my momma's heart just lept for joy! It was so sweet to hear his youthful voice wishing us Merry Christmas! I have a pair of my grandmother's baby shoes. They are brown leather Mary Jane's and are 109 years old. That looks like a great book. I have my grandmothers china cabinet. It was on her back porch when I was growing up because she got a new "modern" one in the 60's. The cabinet belonged to my great grandmother first and it looks great in our dining room. I haven't seen this book, but would love to read it. Love vintage sheet, too. I inherited a black onyx ring from my Mom. She had inherited it from her aunt. It was the only ring she owned. Thanks for a fabulous week of giveaways! Again, Happy Birthday!!!!! I just love your post's. The fabrics look like so much fun. I inhearited a 3/4 Jenny Lind bed from my grandmother's estate. I love it because, Anyone from our large family that ever visted her, has probably slept in it over the years. I am 5'7'', and it almost comes up to my hip. It makes me feel cozy on the cold winter nights. Wow. Great giveaway. I recently found out I inherited an EPP hexagon quilt top (unfinished) that we think my grandmother worked on. It has newspaper pieces and we see dates around 1960 on some of them. The fabric looks to be anywhere from the 1930's to 1960's. It is so special. Once I am more experienced I hope to finish it. I inherited by grandmothers hand crocheted table cloth and other doilies that she made. I treasure each one. Thanks for the chance to win. What a sweet question. My most treasured inherited gift is my Grandmother's small collection of tea cups. I remember as a little girl just staring at those cups and I still get a thrill looking at them. I can't wait to have a tea party with my granddaughter. I inherited a quilt that my Mom had that she inherited from my aunt (my Dad's sister) but she doesn't know where it originated from. It has a scallopped border on it and is a whole cloth quilt. My great Gram was like a grandmother to me. Coming over from England as a child in 1889 by boat, she came to the US with her mother and 3 other siblings. On the boat, her mother was allowed to take only one item. So she took her rocking chair. I have inherited that chair and sit in it often, thinking of the history of my great Gram being rocked in it, my grandmother, my father, me, and my son. Hopefully one day I can pass it on to him for his children late night rock-fests!!! This is a fabulous giveaway! New follower two days ago.... I have my aunt and uncle's copper kettle on my wood stove. I love it because it is beautiful and funky. My aunt passed away many years ago, but my uncle just last November. It is a nice memory of them. Hello from New Zealand. I treasure by Grandmother's 1908 Singer treadle sewing machine, it sits near our front door and is often admired by our guests. I often think of my Gran and imagine her quietly treadling away as she clothed her family, particularly during the depression of the 1930's when times were so tough. I'm a follower. I've inherited a furniture from my grandmother (where she had her sewing tools etc.) + her book of recipes. I inherited one of my grandmothers aprons and one of her brooches. She lived to be 100 and I miss her very much. Thanks again. What a great giveaway! My most precious thing is my great-grandmother's hope chest that she brought from Norway. It has her name on it. My grandmother gave it to me before she died and it will always stay in the family, someday I will give it to my daughter. I've inherited lots of fun things, but I love the gloves that my Great Aunt gave me. They are tiny, (she was tiny) and so fancy. She was very old (108) when she passed away so she had lived through the time when everyone wore gloves. I love them. I just inherited a special sapphire ring of my mother's and her sewing machine cabinet. Thanks for the chance to win such wonderful treasures. Speaking of applique...my husband's grandmother hand appliqued baby quilts for ALL of her great grandkids as they were born. And, in later years, all these great grands received hand appliqued tooth fairy pillows. Pretty little pillows depicting something the child loved and a sweet little pocket to leave those baby teeth for the tooth fairy to trade out. My own 3 daughter's have beautiful doll crib sets that Gramma Gigi made as well. So, while these treasures are not mine exactly, I cherish them dearly and will save them for each daughter as the appropriate time to give them back approaches. And, it is my hope to take up the tradition with my own grands and great grands! Wow ... your entire vintage sheet collection! Probably my favorite, although there are several, would be all the linens, doilies, afghans, etc. that I inherited from my great aunt. Most of the things were made by my great grandmother. There is a large crochet tablecloth that is just beautiful. The book looks awesome and I am somewhat disturbed to realize I have owned three of the sheet sets you show in the photo...before they were vintage. I inherited my grandmother's feedsack collection, something I treasure so much that I have had a very hard time time cutting it. It reminds me so much of her and the aprons she wore. I am using it a little at a time for special projects and am determined that most will find it's way into quilts so that we can continue to enjoy them! I inherited an antique glass box filled with crocheted odds and ends that my great grandmother had used as her "patterns". She called it her pattern box. As silly as it sounds I have an elephant that I cherish. It used to sit on my grandmothers bedside table and we were allowed to cuddle him when we went over to her house but he had to stay on my table. Now he watches over my little girl. You are soooo generous with this awesome giveaway!! My inheritance is a beautiful Cedar Chest - I love to stick my nose in it and take a big whiff of wonderful memories!! Such a beautiful giveaway. I followe w/ google reader. I cherish my great grandmothers brass thimble! I have several pieces of furniture that belonged to my hubbys grandmother. They are special because I never knew my own grandmothers, but my hubby's grandmother was always so kind and nice to me. My daughter loves these pieces as well, and they will be hers one day. It's such a special connection with those who have gone on before us. I'm your newest follower. I inherited quilts made by my grandmother. They are special to me because I can see her face as she describes how she chose the fabrics and their placement. This is a fantastic give away. thanks for the chance. I must say I'm probably a lucky person, I haven't inherited anything so far. I only have a memorable gift - a ring I got from a dear friend who is no more. My grandmother knows that I love to sew and that I love vintage fashion. She's given me many vintage sewing patterns that she used for her children. Included in those are my mother's prom dress pattern. My mother went to prom with my Dad, so that one in particular is cool to have. She also asked me to be the steward of her swimsuit that she wore as a little girl (3 years old) and it's made of wool and looks hand knitted. It's brown and mustard green. I inherited an old, ugly high chair that was my grandfather's. It has been repaired and painted my grandfather's favorite shade of gray. My grandfather was the youngest in his family that had used it and all of my grandchildren have used it. I has about 150 years of memories. I am a follower. I inherited a few old quilt blocks from the 40's from a grandmother that passed away before I was old enough to know her. I cherish those blocks! Thanks for the giveaway chance. Wonderful gift your are giving away. How kind. I inherited my mothers wedding band. She passed just 3 months before I got married. Every time I look at my hand I see my Mum's hand so it reminds me of her.